“Husband and wife singer/songwriter duo Joshua and Amy Anne Krage had been playing music in and around Sacramento for ten years before ever even meeting, let alone playing music together. Filling in for members of the same cover band for a private event in October 2013, their first meeting was their first practice together for their first gig together; their first date was just a few days later, and they've been playing together ever since. As the Big Day of Giving – affectionately known as Big DoG—gears up for its sixth year, several local non-profits have teamed up with Sudwerk Brewing Co. to carry on a community event that focuses on fun and philanthropy. 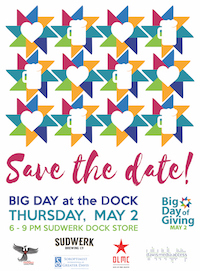 Davis Media Access, Davis Music Festival, Davis Phoenix Coalition, and Soroptimist of Greater Davis are the combined force behind Big Day at the Dock, to be held Thursday, May 2, 2019, from 6-9 p.m. at the Sudwerk Brewing Co. Dock Store, 2001 Second Street in Davis. Davis Media Access and Davis Music Festival began organizing Big DoG events with Sudwerk five years ago, with the event growing and other partners joining over time. This year's event features a record 27 area non-profits participating. Big Day at the Dock features live music by rhythmic pop duo me&you, and jamgrass/reggae/funk band Red Dirt Ruckus; a micro performance by Acme Theatre Company; information tables and giving stations from a wide variety of non-profits; a BBQ by Davis Firefighters; food trucks by Chickpeas and The Buckhorn, and of course the beer for which Sudwerk is famous. Sudwerk is generously donating a portion of beer sales to offset event costs. Local radio station KDRT 95.7 FM (a project of Davis Media Access) will provide a live broadcast of the event from 6-9 p.m., which will also be live online. Chris Preston provides sound for the event. Sudwerk is an all-ages venue and entrance is free; there will be some kids’ activities available as well. For more information, please email Autumn Labbe-Renault at info@davismedia.org or call DMA at (530) 757-2419. A few months ago, our executive director wrote about some FCC rulemaking that could seriously harm community media centers like DMA. There's an opportunity to reach out to our elected officials on this matter right now, and it takes just a couple minutes. Please join us in advocating for the important role that community media plays in our community. Donations, whether by local businesses, donor-advised foundations, or individuals, keep KDRT on the air, and help support DMA's work on local election & youth media services. We fundraise all year, but conduct our major drive during the spring months, with on-air fundraisers on KDRT in both fall and spring. Our goal for this year is $30,000. DMA's donors and supporters make possible a great deal of the work we do. We appreciate you! This list is current as of Nov. 30, 2018. Building community through media is what we do at Davis Media Access (DMA), and we make sure that starts with some of the younger members of our community. DMA has decades of experience teaching youth the basics of media production. These exciting classes teach production skills in areas such as camera operation and lighting, storyboarding and script development, sound recording and greenscreen use. DMA builds into all its curriculum critically needed media literacy training, and our workshops take place in the only HD studio in town. Participants get hands-on experience with quality equipment, work collaboratively, and share their work at the completion of the camp. Classes are taught by DMA staff and frequently assisted by students from past workshops. Davis Media Access (DMA) is celebrating 30 years of service to the community! Our work strengthens community through grassroots radio, local TV, websites, and archives. Will any of the graduations be broadcast live on DJUSD.tv Comcast Channel 17 or streamed live on the Internet? Not this year. Davis Media Access (DMA) is a community media center that has served Davis and environs for more than 25 years, amassing an archive of more than 10,000 locally produced videos. These programs tell the story of our area: our struggles, triumphs, concerns, and motivations. Most were either produced by, or feature, community members. In an era where broadcast outlets became fewer and increasingly homogenized, these programs helped tell the story of our community in a very real, and meaningful way, often covering what the Sacramento media market would not. Davis Media Access (DMA) is a dba of Davis Community Television, a 501(c)(3) non-profit corporation. DMA is a community media center serving Davis, CA and surrounding areas. Our mission is to enrich and strengthen the community by providing alternatives to commercial media for local voices, opinions and creative endeavors. Our major projects are KDRT 95.7 FM, Davis Community Television and DJUSD Channel 17.